Medical Spelling Dictionary for Pages is a word-list of over 100,000 medical terms. The App installs this wordlist to the spelling dictionary used by Pages. This allows you to see at a glance which medical terms are spelled correctly and which are not. No more red squiggly lines under something that is spelt correctly…! Because Pages does not ship with words tailored to the medical and health community many words are marked as incorrectly spelt. It can be hard to see which words you have actually mis-spelt. This medical spelling dictionary contains all the terms you will need to write papers and medical documentation. This spelling dictionary is very easy to install. Once installed you can quickly can find any errors you may have made. No longer will embarrassing mistakes be hidden in a mass of red lines. This tool is useful for both medical students as well as for medical professionals alike. No more having non-correct words error-flagged. Or have Pages fail to suggest the correct word. This dictionary is also highly useful for those in therapeutical care. Or anyone else in the caring professions who needs to have professional level output without any misspellings. With this dictionary you will no longer have to hunt through the mass of words under-lined in red to find out which words are spelt incorrectly. Medical Spelling Dictionary for Pages will help you save time writing. So you can use this time for others. Life-time updates, no subscriptions required…! Includes trade and generic names of pharmaceutical and medical products. 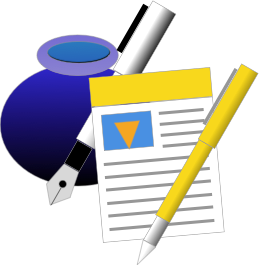 This App will save you time writing papers, patients notes and any other medical text. Installing the Dictionary is very simple. Buy a license from the our website. 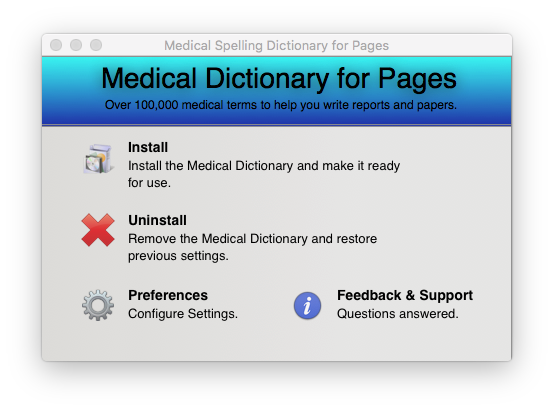 Download the Medical Dictionary for Pages installer to your Mac. Double-click on the zip file that has be downloaded. Double-click on the package file that has been un-zipped. Run the Medical Spelling Dictionary for Pages Application. 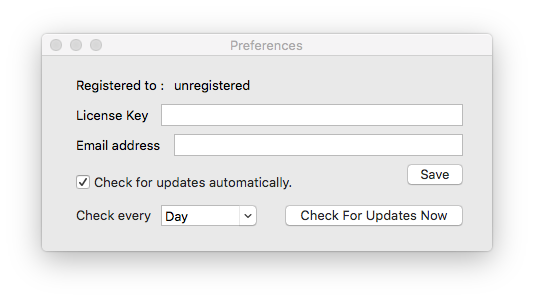 Enter your license details into the preferences dialog and press “Save”. Press “Install” to install the dictionary and then re-start your Mac. 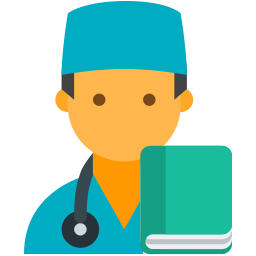 Now write your medical documentation…! Enter your address to download the Medical Spelling Dictionary for Pages. However, you will need to buy a license to use this App.